When we are young we have very little patience. What we want, we want now. Excuses are not tolerated. How quickly our desire is fulfilled is all that matters. So what happens to that short-tempered and demanding child to turn them into someone who can outlast the tantrum of a two year old, out love the anger of a teenager, or serve an ailing spouse 24/7 for years on end without complaint? There are at least four things that go into developing patience. 1. We need to learn to wait. 2. We need to relinquish control. 3. We need to learn to trust. 4. We need to see things from other people’s perspectives and not just our own. Learning patience is a hallmark of emotional maturity. Learning to patiently watch events unfold around you, wait in a line, wait for someone else to make a decision or to act, is a big part of patience. Being able to wait patiently for something to occur requires that we feel safe and secure within ourselves. Learning to wait is a skill that most people have to learn over a period of many years. Have you ever stood in line at the grocery store or in a government office with someone who cannot abide being made to wait for anything? It can be an uncomfortable experience to stand there with someone who is complaining, and chaffing at the bit, so to speak. You may be thinking, “What’s the big deal?” But to that person, the world is unjust, unfair, and cheating them out of their precious time. Learning to allow things to happen at their own pace, and allowing others the use of their agency is not something that comes naturally for most of us. As you read through the other three component parts of patience, notice how often waiting is mentioned. Try to imagine how patient the Lord must be as He waits for us to make up our minds and commit to something, as we vacillate and waffle on our decisions, never completely committing to a course of action. His patience is extensive. One of the connectors between patience and maturity is found in the ability of the patient person to relinquish control of a situation. Those who lack patience insist on things being done their way and according to their own timetable. Take for example, a hungry baby. The longer the baby is made to wait for food, the more upset the baby becomes, and the louder. Now think about the loving husband whose days are spent caring for an ailing wife. His whole schedule revolves around her needs. She must be fed, dressed, moved, taken to appointments, etc. He does not berate her for her illness, does not become angry when she spills something or forgets to do something. The reaction of the baby and the husband are on opposite ends of the patience scale. What happened to help that man become the way he is now? He was once like that baby, demanding and impatient. When and how do we learn to let situations play themselves out, rather than trying to control everything that happens? How do we learn to wait and see where we are tomorrow and make decisions based on where we are, rather than on where we think things ought to be? It is not uncommon for the most difficult experiences in life to require of us patience in great supply. When we are faced with sickness, unemployment, wayward family members or friends, when we need to repent of things we have become addicted to, and in many other circumstances, patience is required. The key to gaining this part of patience is coming to understand that we do not have control over other people’s agency. It is difficult for many of us to let others make their own decisions in their own way and in their own time. We try to push, urge, encourage, or even pressure them to do what we want them to do. Each of us must learn that once we have taught, entreated, and reasoned with someone who is or is becoming an adult, we have to allow them the ability to make their decision then live with the consequences. Once a course of action has fallen into the court of another person, it is out of our hands. We must learn to stand back and let them make their decision, be that what it may. This is especially difficult for parents to do when it comes to dealing with their children. Learning when to let go of the responsibility of someone else’s decision is difficult. Too often parents blame themselves and take responsibility for the decisions their children make when those decisions were not the parents’ choice to make in the first place. The principle of learning to relinquish responsibility for the decisions of others is a meaty concept. This treatment of it only scratches the surface of what is required. For some people this may be obvious and they have already learned how to do it. For others this may be a new concept that is very uncomfortable and will cause a considerable amount of emotional chafing. Be patient and give the idea time to sink in. Patience requires trust. In order for us to return triumphant to our Father in Heaven, we will need to learn to trust Him and His Son, Jesus Christ. The Lord requires many things of us, all of which mature us and prove us and make us fit for His kingdom. One of the things we will all have to learn is to allow things to unfold in the Lord’s due time. This can be difficult, because some of the blessings and promises we have been given will not see fulfillment in this lifetime. Other promises do get realized in this life. When Joseph Smith was called as a prophet he was very young. Young people have to learn patience, and patience was one of his first lessons. 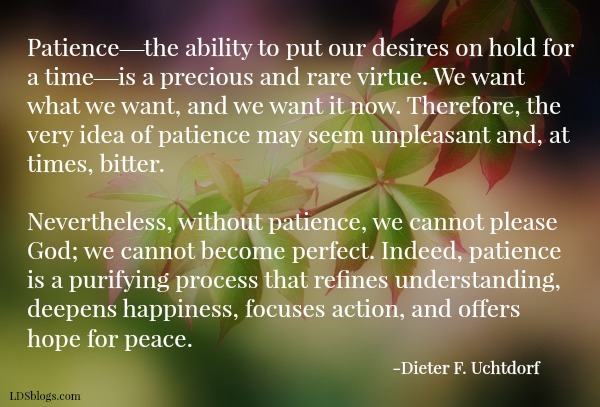 In a talk given by President Thomas S. Monson in October, 1995, he addressed the sacred nature of the virtue of patience. The Lord needs His servants to be able to wait on Him while He prepares the way for His blessings to be received. In some cases we need to grow spiritually before we can receive a promised blessing. In some cases we need to learn some lessons before we are prepared to receive what He has in mind for us. It is all part of trusting that the Lord is telling the truth when he says that His ways are higher than our ways, and that His thoughts are higher than our thoughts. Something I have seen demonstrated lately is the patience of the Lord in dealing with each of us. Think about the times you have stalled in doing what you know you should have done. Did you stop coming to church for years? Did you take up habits that were detrimental to your own happiness? Did you carry a grudge that soured your life for years and years until you were willing to forgive and forget? None of us is perfect. We have all tested the Lord’s patience in our lives, yet we haven’t heard a peep out Him. We have been given the truth. We have prophets who tell us what we need to do. We have the whisperings of the Spirit to help nudge us into doing things that will bring us happiness in the end, but it is always up to us to make those good decisions. The Lord does not scream at us, stomp His foot and throw a tantrum, or demand that we serve Him. He soothes us with His love. He demonstrates what happiness looks like if we will trust Him. He waits for us to choose Him. He shows us that He can be trusted completely by always honoring our agency. As long as our lives last He quietly works through others and through circumstances to try to show us the way home, the way to happiness. In President Monson’s first trip beyond the Berlin Wall he made a promise to the Saints there that if they remained faithful and were patient with the Lord, they would not be deprived of any of the blessings of the gospel than anyone else in the world had available to them. At the time they had no temples, no stakes, no wards, just branches. They lived in fear of their government. [quote_box_center]Little by little the promise was fulfilled. First, patriarchs were ordained, then lesson manuals produced. Wards were formed and stakes created. Chapels and stake centers were begun, completed, and dedicated. Then, miracle of miracles, a holy temple of God was permitted, designed, constructed, and dedicated. Finally, after an absence of fifty years, approval was granted for full-time missionaries to enter the nation and for local youth to serve elsewhere in the world. Then, like the wall of Jericho, the Berlin Wall crumbled, and freedom, with its attendant responsibilities, returned. Learning to trust the Lord and His promises requires that we learn the patience to wait for the Lord to act and fulfill His promises. Some have difficulty learning to trust the Lord because they have not learned to wait. This is perhaps the most difficult part of learning to be patient. We must first learn to trust. We are willing to wait for someone to do what they promised if we trust them. If we do not trust them we are not usually willing to wait for the promise to be fulfilled. As I mentioned at the beginning, patience includes being able to see someone else’s point of view. People with no patience make terrible diplomats or negotiators precisely because they can only see their own point of view. Little by little as we serve others, we begin to see that our own blessings are, in large measure, based on the blessings we are able to see blossom in the lives of others. Being a part of that experience brings us joy, even if we are suffering at the time it happens. When we are taught to fast it is with a happy countenance and joyful step that we serve and lift others. This happens even as we deprive ourselves of food and comfort. As we go without food on Fast Sunday and pay our fast offerings, we may go hungry, but when we come to know how much of a blessing the fast offering is in the lives of those who truly have nothing, our own want is overshadowed by gratitude and joy over others’ blessings. Need I ask if the Savior finds joy in what He does? Assuming He does, where do you think it comes from? It certainly does not come because He got His own way with things in mortality. He wasn’t happy in mortality because He got to call the shots and make everyone jump through hoops for His personal pleasure. He knew that the greatest joy comes from serving others, and being obedient to the instructions given by our Father in Heaven. His constant reminder to one and all was that He only did what the Father commanded Him to do. He waited on the Lord in all things, trusting that our Father had His best interests at heart. This includes the times of His greatest suffering in Gethsemane and on the cross. He knew that was what the Lord wanted Him to do, so he was willing to obey and wait upon God, no matter what it cost Him personally. He trusted that the higher ways of the Lord would bring not only Him happiness in the end, but all of us happiness as well. Patience is indeed a virtue, one that takes trials and tribulations to develop. But it is difficult to cultivate a virtue by stumbling blindly through the dark. Look for those times when you are inconvenienced or are put upon by someone else and are unjustly treated. Try to act like you think the Lord would act faced with the same situation. When we take our sufferings and sorrows to the Lord in prayer, He will send the Spirit to comfort us. He also gives us, through that same Spirit, added strength to endure and endure well. We will learn to trust the Lord, learn to trust over long periods of time, learn to serve others in order to increase our own joy, and learn to find grateful hearts for God’s personal patience in our own weaknesses. Thank you for breaking this down so nicely. I love the examples you gave, too.